On the 28th April, China Railway 11th Engineering Bureau Group Limited launched the first of its two 6.2m diameter Robbins EPBMs on Lot 12 of China’s Xi’an Metro Line 1. The second machine will be launched this month. 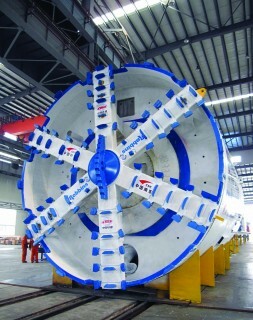 The Robbins machines will excavate parallel 2.3km long tunnels, passing through four cut and cover stations stretching from Kangfu Road to Chang Lepo areas. The two TBMs will be the first to start excavation on the 26.4km long Line 1, and will be followed by eight other machines excavating their respective lots. Both Robbins machines are customized for the ground conditions, that includes sand, pebbles and clay with significant ground water. Spoke-type cutterheads and 800mm diameter screw conveyors will aid advance while maintaining a water-tight seal and a balanced pressure. The line will pass close to a number of ancient structures, including a bell tower and city wall dating back to the 12th century. Due to the sensitive area, city regulations stipulate a maximum of ±15 mm surface extrusion or settlement on tunnelling projects. Subsidence and vibration will be carefully monitored throughout excavation to avoid any structural disturbances. The new metro tunnels in Xi’an, one of China’s most ancient cities and home to the world famous terracotta warriors, will move commuter travel from surface streets to below ground. Once complete, Line 1 will travel from north to south through downtown areas of the city. The city is currently reliant on surface transportation only – the underground line is estimated to reduce traffic times across the city from well over one hour to 39 minutes. Line 2 of the Xi’an metro is currently under construction and will be operational in 2011. Three more lines are planned for excavation in the next five to seven years.